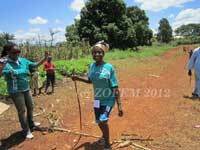 August 26, 2012 shall forever remain historic in the minds of some 70 mothers, grandmothers and great grandmothers, aged 75 and above who participated in a 700m honorary fast walk race in Bafanji Village, Northwest region, Cameroon. Photo by Zofem (article is a re-post from A Safe World for Women)The whole idea of Make Mama Visible began eight months ago, after series of friendly visits in some rural communities across the nation, in which I realised the living conditions of most aged mothers in rural Cameroon are so deplorable, full of sadness and pain – with little or no special medical attention and/or healthcare facilities. Again, I noticed that many of the aged mothers live alone, and would have to farm, cook, and walk distances to fetch water. In addition, I also realised that most of these aged mothers have become caregivers to their great grandchildren, whose parents are either dead or have migrated to the urban cities (diasporas) in search for better livelihoods. In pursuit of how to make mamas happy, honoured, and not to feel deserted, the thought of a public walk came to mind, to create space for aged mothers to become visible through sport. And Bafanji village became the ideal community to begin with. Photo by ZofemThanks to our sponsors’ generous support, this maiden edition of MAKE MAMA VISIBLE was a huge success. For it was able to attract as many as 200 interested individuals across all works of life – the media, the traditional elites, business entrepreneurs, tycoons, local government, and other international networks – each of whom related to the need of bringing attention to aging mothers' special needs. And I am proud to say that, just days after the race, MAKE MAMA VISIBLE participants have all been profiled on the International Museum Of Women (IMOW) global arts photography project, which highlights the values of Motherhood. And Bafanji community is proud to have been the first to welcome the idea to reawaken new thinking and perspectives about [elderly] mothers. 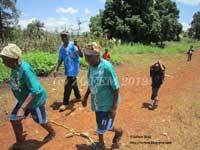 Photo by ZofemAgain, recently, I received calls from some elites from neighboring villages requesting for a similar event on aged mothers in their communities. 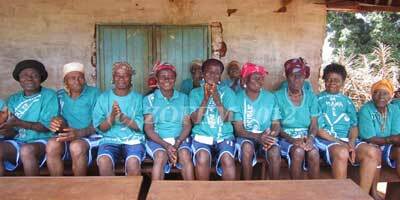 In addition, I also received invitation from some interested persons in Buea and Alou in the Southwest region and Bamileke communities (Western region) to organize an aged mother race there. Meanwhile, many families are already talking about bringing friends and relatives to see them next year! Photo by ZofemIn all, the project MMV was able to raise FCFA 879500 and a great deal of those funds came directly from our sponsors and partners: Soucedu pay.com, Olutosin Tie and Dye, VIAF, RUWDEC, WFAC Buea, HRM Fon F.N Ngwefuni II of Bafanji, Mbondgulo Patrick Nkwuti, and other individuals who would like to be kept anonymous. It is worth noting that this race couldn't have been done without our sponsors’ generosity and volunteers’ commitment. Once more, thanks for putting a smile on mama’s face! On behalf of the MAKE MAMA VISIBLE team, I would sincerely like to extend a heart-felt thank you to all our donors and volunteers for their generous contribution and commitment to making this event a success! 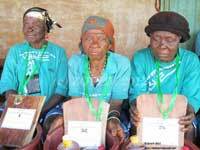 And to all the beneficiaries; the mamas [mothers], I say thanks for courageously participating in the race and bringing aged mother to the spotlight. I look forward to speaking with you more about next year's event in the upcoming months. Thanks for posting. What was the impact of the walk on these wonderful, active Mamas?